The Hughes & Kettner Black Spirit 200 is the latest such product to tempt guitarists. 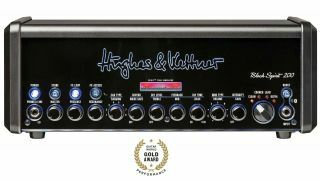 Hughes & Kettner explains it best: “The sound experience and feel of a high-quality tube amp circuit. The flexibility and versatility of a modeling amp. The ease of use and robustness of a transistor amp. All this is contained within Black Spirit 200.” I’ll add that it looks like a traditional guitar amp, sounds like any guitar amp and operates like a multi-channel guitar amp, but because it’s packed with an abundance of features and sounds, it’s completely unlike any guitar amp we’ve ever experienced before. And it costs less than $800. We’ll do our best to cover the main attractions below. FEATURES Do not turn the page: The Black Spirit 200 features an all-analog signal path, but it truly sounds, feels and reacts like a tube amp. It delivers an impressive 200 watts of output power that can be scaled down to 20 or 2 watts and provides four distinctly voiced channels: clean, crunch, lead and ultra. There are also built-in effects (reverb, delay and modulation, i.e. chorus, phaser, flanger and tremolo), a noise gate and Hughes & Kettner’s acclaimed Red Box AE+ with eight cabinet emulations. All of the front-panel controls are fully programmable and laid out in a very easy-to-use configuration. There’s a four-position switch for selecting the channel and a single set of gain, volume, bass, mid, treble, noise gate and sagging controls (control settings are saved in memory so redundant knobs for each channel aren’t necessary), which do double duty as cab type, reverb, delay level, feedback, delay time, mod type and intensity controls when the effects section is engaged via the FX Access switch. The master section features master volume, presence and resonance controls, and boost, FX loop and store buttons complete the front-panel configuration. PERFORMANCE I have played many modeling and amp emulation products that made me consider selling the 50 or so amps I have in my studio, but the Black Spirit 200 has me convinced that now is the time to unload. With the exception of perhaps the quirkiest shoe-box-sized combos from the Fifties and Sixties with junkyard speakers, the Black Spirit 200 produces an astounding range of tones that will satisfy the most discriminating amp connoisseur, particularly fans of the classics that begin with F, M and V as well as a full alphabet’s worth of modern boutique tones. Although the amp works on an analog platform, any blindfolded tone tester would be convinced it’s a tube amp as the feel and harmonic complexity is dead on, particularly thanks to the innovative Sagging control and Spirit Tone Generator technology. Want clean tones with sparkle and balls? It’s here. Gritty overdrive with raunchy attitude? Ditto. Massive high-gain distortion grind that’s bigger than Kanye’s ego? Yes sir. So many great tones abound within the Black Spirit 200, but saved presets are only accessible via the forthcoming free app or the optional Hughes & Kettner FSM-432 MK III MIDI board, which is absolutely essential for gigging guitarists who want to instantly access all of the amp’s sonic goodies on stage. However, even without those items it is very easy to dial in exactly the sound you’re looking for as the controls are all familiar and intuitive.